Ballpark Basics: Two words summed up this evening for us: Jimmy Hart. 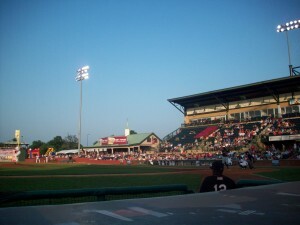 Ballpark Breakdown: You know you are in horse country when you go to a game at Applebee’s Park. From the turrets modeled after Churchill Downs on top of the grandstand to the Kentucky Derby starting horn at the beginning of the game, tickets should come with a mint julep. The park also features the Budweiser Pavilion along the first base line where fans can order beer and watch a game from an area of picnic tables. The Pavilion is modeled after a horse stable with a life size horse watching the game. Behind home plate and accessible from the stadium’s main entrance, the “Maker’s Mark Club” restaurant caters to members and guests with passes. The third base line features a small but popular area for families to watch the games and includes a kids area with a carousel, bouncer and obstacle course. The bleachers, behind left field, hold more fans, and for large groups and events, check out the “Pepsi Party Deck” over the right field wall. Really a beautiful stadium with great views, but if you want an up close look at the stats, there are two video boards and one manual scoreboard with scores from other games. Home of the Joe Mikulik meltdown. Brew Basics: Not a wide selection, but consistently decent beer. Limited touring opportunities for out of town visitors. We didn’t arrive in Lexington early enough to tour this brewery (they close at 2 on Saturdays) but we spent that evening touring local spots, and thoroughly sampling their wears. According to information they provided us, if you’re able to make it for a tour – 3pm Mon through Fri and 1pm Saturday – they’ll take you through both the brewing and bottling processes; and can conclude your tour with some complimentary sampling in their tasting room. Something we’ll absolutely do the next time we’re around. This little town surprised us both with all it had to offer, so we’re really looking forward to a second visit! Three possible selections, all ales. 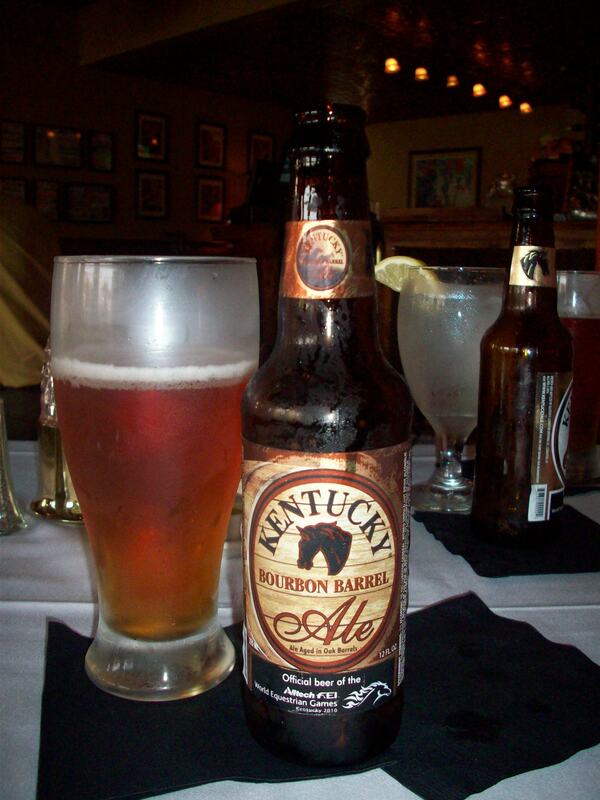 Kentucky Ale’s claim to fame (or at least reason for settling in Lexington) is the water. All beers are made by water taken from the limestone bedrock that is so prevalent in this part of the country. Kentucky Ale – The O.G. Has more of a coppery color than a traditional ale, very smooth flavor and easily drinkable. I’m not sure if the special water really makes that much of a difference here, but hey, it’s a good story. Kentucky Light –Lexington brewing describes this one as made in the style of Kolsch beers. It’s definitely a light beer, but again very drinkable with no watered down qualities that you can find in many lites. A happy solution for all you athletic beer drinkers out there. Kentucky Bourbon Barrel Ale – It’s bourbon barrel ale, what’s not to love? This is actually a great one to start with if you are new to the bourbon barrel style, for while some of the beers in this category can be a bit overwhelming with the bourbon flavor and smell, this has the unique taste that you expect, without being overwhelming. Jim’s favorite of the three, and absolutely the best beer this brewery has to offer.